The Peru Project is where we partnered up with the organization Days for Girls and Helping Peru to create feminine kits for females in Peru. When women in Peru have their periods, they are disgraced and have no available resources to help them function until it passes. This causes them to be completely restricted from society as they deal with the pain of infections and unknowingly make their situation worse by douching with laundry detergent. Hence, WAC’s job was to sew colorfully patterned drawstring bags and put together the needed kits. These kits include reusable, sanitary pads and liners that allow women to perform in their everyday lives in a clean, safe manner. There’s also a washcloth, soap, and period tracking chart included in a zip lock baggie in the kits so that females in Peru can wash their pads and liners. The colorful drawstring bags are to avoid embarrassment when going to wash their materials, as periods are taboo in their country. The admirable fabric also gives them something nice to care for and feel proud about. 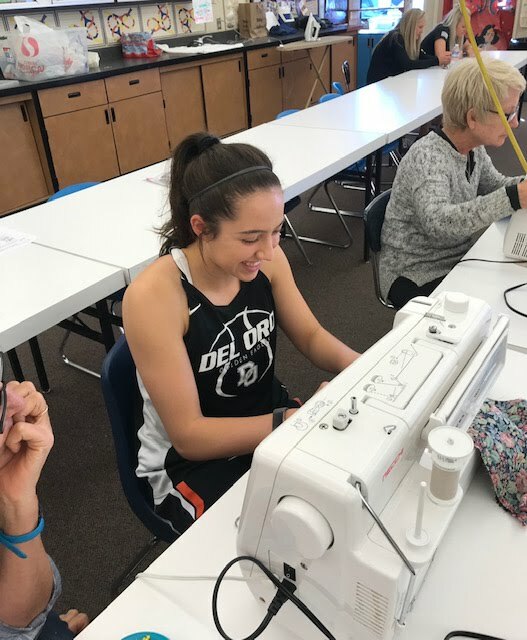 WAC dedicated multiple hours to measure, cut, sew, and pack the drawstring bags. When these kits are taken over to Peru, 50+ girls will be taught about the menstrual cycle and women’s health, all while receiving beautiful kits sewn by girls in another country who really cared.